We are a Community Interest Company based in St Austell, Cornwall offering an accessible and cost effective Integrative Counselling Service open to Children and Adults on a 1 to 1 basis. We also offer Clinical Supervision to Trainee and Qualified Counsellors. Physical ill-health or disability, Anxiety, Depression, Low Self Esteem, Lack of Confidence, Relationship Issues, Separation, Stress, Anger, a Phobia, Bereavement, Divorce, a Traumatic event, Alcohol or Substance Misuse, or you may just be finding life difficult to cope with right now. Counsellors Together offer one to one Counselling support that is promptly available and effectively targeted, drawing on a variety of Therapeutic approaches to individuals experiencing Mental Health Issues. 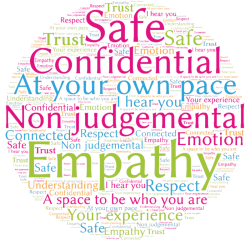 All Counselling sessions are held in a safe and confidential environment. Our service aims to reduce the effects of emotional distress, stigma and discrimination and in turn promote independance and improve Health and Well-being of Individuals that access our service. The outcome for clients will include better mental health, improved self-esteem, feeling and being safer, reduced harmful coping strategies, improved self worth and awareness of their situation, improved life choices, healthier relationships with others, reduced in anti-social behaviour and reduced Alcohol and Substance misuse. We are running a funded project for individuals with Alcohol, Substance Misuse and anti social behaviour. Counsellors Together have several comfortable therapy rooms that can be hired on an hourly basis, for Therapy and Events - please send an enquiry for more information. Please explore our website for further information on what we do.